Inaccessible Tibet. These words conjure images of remote mountains inhabited by yeti and adepts who sit naked in the snow, warmed by elevated body temperatures. Tibet has remained a very difficult place to visit and is more fantastic than imagined. It is a land of immense contrasts: snowy peaks and sandy deserts, barren plateaus and forested mountains, empty expanses and crowded cities, and a deeply religious people ruled by an avowedly atheistic government. In June-July 1996, the National Association of Geoscience Teachers and Cypress College (CA) in cooperation with the Chengdu Institute of Technology made Tibet accessible to a small group of geologists. 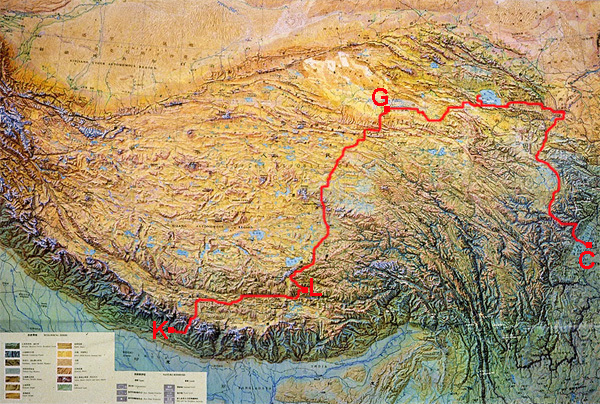 We travelled from Chengdu (C), to Golmud (G), to Lhasa (L), to Katmandu (K). This virtual field trip attempts to capture the highlights of that trip, which was led by Associate Professor He Dashun, Professor Lin Maobing, and Associate Professor Wang Wenbin (all from Chengdu) and Dr. Dorothy L. Stout from Cypress College. Without the diligence of He Dashun and his associates, this wonderful trip would have been impossible. The Virtual Trip to Tibet can be taken in the original order by starting in Chengdu and selecting "Next" at all subsequent choices. Alternatively, the cybertraveler may select specific locations using the Field Trip Guide. Although the trip concentrated upon the Geology of the Tibetan Plateau and mountains along its eastern margins, this virtual trip includes some information on the Geology of the Himalayan Mountains, to provide a more complete picture of the of the tectonics of this region. The trip also provided a unique opportunity to make contact with the fantastic people and culture, and an inside view of the unsettled political situation in Tibet.